'Cornetto' brand's tagline Love Spark did manage to spark love during advt shooting between Amrita Rao and Jal band member Goher Mumtaz. As always, Amrita looks innocent, cute, lovely in the advt. 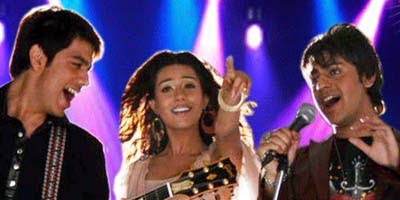 Here is Amrita Rao song and dance look with Jal band members from Cornetto Love Sparks campaign.